Ever had a case of the Alphabet-a-Heebiegeebies? Little Charlie Foxtrot certainly has. He knows lots about building dens and climbing trees and football and space rockets... but the ABC? This is where he runs into trouble. Charlie's class is having a test. It's on Friday and it's on ALL of the letters of the alphabet. Charlie panics - but lucky for him, two chaps from the Ministry of Letters just happen to be passing by his window. "Oh my sausages!" yells Ollie. "We'd better send for help at once," says Stan. 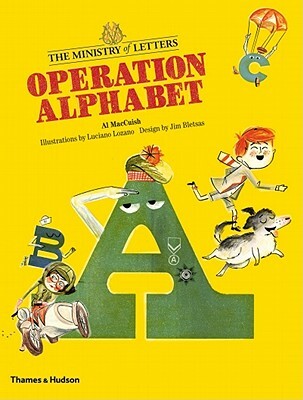 And so a telegram is phoned through to the Ministry, asking for help from the Special Service Alphabet - with Colonel A in full command, backed up by young Letter B. The team's first challenge is to get to Charlie, so they send themselves by first class mail - but just as the parcel makes it onto the train for Charlie's house, a C for Cat attacks the box! Thankfully, a D for Duchess just happens to see them running from the cat, and quickly helps the letters climb to safety - taking it upon herself to deliver the letters personally to Charlie - who is overwhelmed by this alphabety aid. One straight line and two big tums. think of them as two big drums! Of course, Charlie quickly absorbs these very creative of lessons, and the next day at school passes his ABC test with a resounding A+. It was so successful, the Ministry of Letters gave all his letters an hour off, which is why the Sunday papers were a bit late that weekend. This is a delightfully witty and charming book, with adorable characters and vibrant use of imagination by author MacCuish. Illustrations by Lozano and book design by Jim Bletsas make for a formidable team of talent that cast this book into one my absolute favourites for 2011. A must for picture book collectors.